The Nokia Lumia 900 for AT&T has been around for over a week now – heavily promoted, temptingly priced at $99 on contract, with all major kinks ironed out already. And it appears that the smartphone is selling well since the AT&T online store is currently out of stock. Even Steve Wozniak got himself one to play with. But it seems like AT&T subscribers won't be the only ones having all the fun. 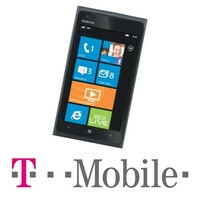 The Nokia Lumia 900 may soon come to T-Mobile, if an employee at a T-Mobile store is to be trusted. The “Lumia 900 will be coming to T-Mobile this summer” were the employee's exact words, and reportedly, they were stated with a great deal of confidence. Frequent readers might recall that rumors about the Lumia 900 launching on T-Mobile we have stumbled upon before. Back in January, a report suggested that the smartphone was bound for T-Mobile as soon as AT&T's 45 day exclusivity period (this number is unofficial, by the way) runs out. Furthermore, that very same report mentioned that the device will be treated to a camera upgrade replacing the 8-megapixel shooter with a 12-megapixel one, but that should be taken with a huge dose of disbelief. So, T-Mobile subscribers, would you be interested in the Nokia Lumia 900 if the carrier releases it? Let us know by dropping a comment below. If it were released within the next month or two with a better camera I'd be very interested. I still prefer HSPA+ over LTE on smartphpnes due to battery life. Windows phone limitations on display resolution and processor speed still bug me though, which why my current plan is to wait for Apollo. Battery life on the Lumia 900 will give most HSPA+ handsets a run for their money, trust me. Does AT&T have a ninety day exclusivity period? Wow....are you flipping serious???? An employee at a t mobile store is the source for this news article???? Are you freaking.joking..??? How tthe funk does a employees at a retail location know anything about a phone.possibly being sold on the carrier networks????? Because it's his job to sell phones, perhaps? Its my job too...has been for a decade. yes i would get one in a heart beat. The tech rumor mill is becoming an entire internet entertainment arena in itself. Our most capable phone is the HTC Radar 4g(the only video chat capable Windows Phone). Of course we'd be freaking interested.lol Rumors. Rumors. I learned to have a believe when it happens approach after being let down so much. the nokia is definitely more capable than the radar. Who cares about video calls when you have to give up navigation to get it. ill take nokia maps over video chat any day of the week... and judging by sales, so would most customers. That's your opinion plus the Nokia 710 is only like $50 so who wouldn't get it. Give me video chat and I'll work with the Bing maps. Navigation beyond what's already available isn't all that necessary. This is just MY opinion. Doesn't the radar have mobile hotspot but the 710 doesn't?